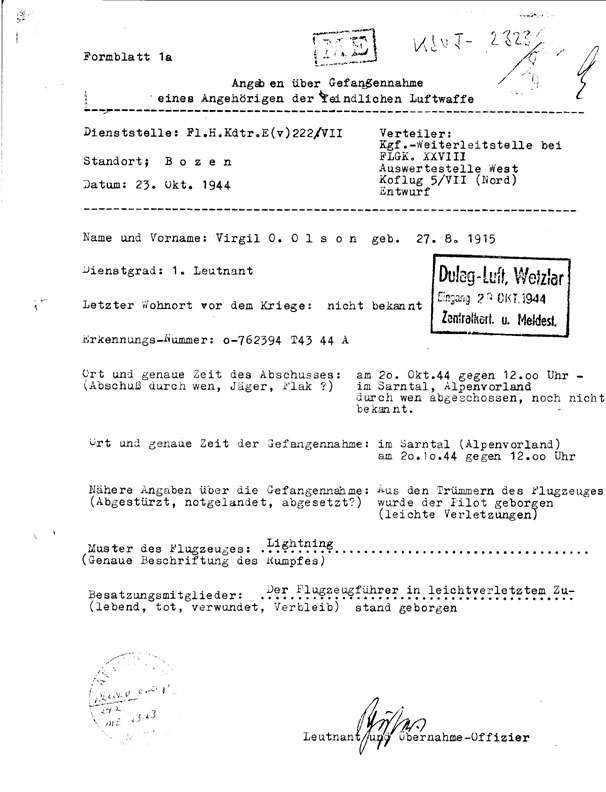 Ich suche jegliche Hinweise zu den Kämpfen im Elsaß 1944/45, auch über die Lager für deutsche Kriegsgefangene im Elsaß. My grandfather was Herbert Victor Stockwell. He was a Remmie (Royal Electrical and Mechanical Engineer). He was captured in or near Tobruk. He spent some time in camp 78 in Sulmona, Italy. Then he was transferred to Stalag VII A where he spent the rest of the war as a POW. As far as we know he was captured with some others, whilst they were out fixing a tank, or disabling a tank, as Tobruk at the time was falling into enemy hands. If anybody has any more information about my grandfather please can you email at [email protected]. Ich habe eine Studie über die Verarbeitung der Lagererlebnisse japanischer Kriegsgefangener - in Wort und Bild - verfasst. Für eine vergleichende Studie über die Weise, wie japanische und deutsche Kriegsgefangene ihre Erlebnisse schildern suche ich Berichte ehem. deutscher Kriegsgefangener. (keine wissenschaftl. Aufarbeitungen).
" "Je vous remercie pour la page faite à mon père." "Congratulations on your web site, it looks very interesting." "My father was a Sgt in The Durham Light Infantry, and was captured on the island of Cos. From there he was transported to Mooseberg and to Stalag VII A. I have in my collection his ID tags and a paper card that was above his bunk. With true British outlook he always said the Yanks had better food than them but the poor Russians were hardely fed at all. His POW number was 124178 Sgt. R. H. Webb, better known as "Major" (nothing to do with his rank)"
"I discoverd your website and found it both interesting and sad. Time covers so much pain." "Many, many thanks for putting together such a detailed website. Keep up the excellent work. With best wishes, Elizabeth W"
"I help with a site in my country (Brasil) dedicated to the history of both world wars www.grandesguerras.com.br. This has a section called "tales from the front". Recently I decided to put on the site the personal experiences of a Brazilian officer (1st Lieutenant Emílio Varoli), which was one of the soldiers of the 1st Brazilian Expeditionary Force (FEB) fighting in Italy in 1944 and 1945 taken prisoner. In his case, as well 21 other infantry and 2 figther pilots - to Stalag 7-A (Varoli was prisoner number 143.040). To complement his narrative I needed some more material on the camp and I did an Internet search, finding http://www.moosburg.org, which greatly impressed me. So I am writing this to thank you fore the excellent effort you made to preserve this facet of German history - thank you very much!" "Im Kriegsgefangenenlager Oflag IX C Molsdorf bei Arnstadt (Thüringen) kam es 1943 zu einem Ausbruch kriegsgefangener britischer Offiziere. Ich bin sehr daran interessiert, hierzu Näheres zu erfahren. Haben Sie Hinweise, Quellen,evtl. Dokumente hierüber? Mein Vater, Ernst Hoefer, geb. 31.8.1896 in Altenburg, zuletzt wohnhaft in Saalfeld, war damals Hauptmann und leitender Lageroffizier." Jacques Legrand erforscht die Geschichte französischer Kriegsgefangener in Deutschland und deutscher Kriegsgefangener in Frankreich. Für seine Website Aétius: Kriegsgefangener - Prisonnier de guerre sucht er dringend Zeugenaussagen deutscher Soldaten, die im Zweiten Weltkrieg in französischer Gefangenschaft waren. Marie-Noëlle und Daniel Verrey sind auf der Suche nach deutschen Kriegsgefangenen, die von 1945 bis 1947 auf dem Bauernhof von Jeanne und Marcel Verrey in Brognon (Côte-d'Or) gearbeitet haben. Unter den Gefangenen waren Kurt Spittel (geb. 5.12.1920 in Lauterbach) und Alfons Kromer (geb. 15.2.1921). Wer diese Personen kennt, möge sich bitte an Familie Verrey wenden. "I like to research items from WW II, American and German. Currently working with the information about Stalag VII/A and photos. Have not been able to locate all the information I need for my research. Perhaps your researchers could direct me to information I have missed. 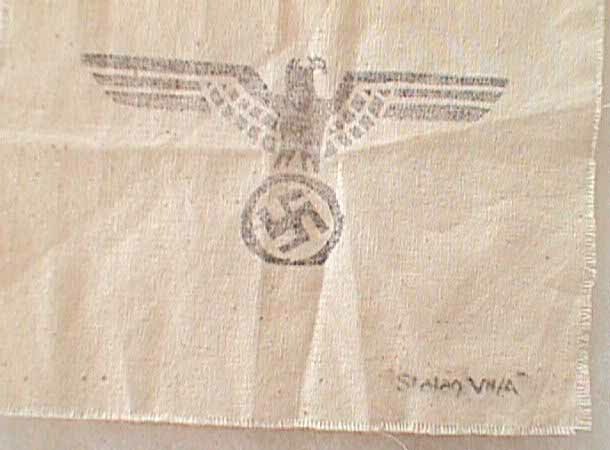 The item is German WWII era, cloth 43/4"by 5" with German Eagle stamped in black ink in center. In the right hand lower corner, stamped in black ink is Stalag VII/A. I don't know if this was part of a armband or worn on prisoners uniforms. Would appreciate any assistance you might be able to give me (larger image)." "I served in a unit that guarded this camp in the spring of 1946. I can't remember the unit but it had a nickname of go devils. It was a red devil's head with the letters go. I had a small chest made to keep my stationary in that had this logo. I am at the age now that a lot of the past is blank but for the first time, I would like to recall some of it. I moved from there to Augsburg and served in the 9th Signal Company. Thanks for any inf. This is a neat web site." "My father was a Private in the United States Army assigned to the 36th Cavalry Troop (Mechanized), attached to the 36th Infantry Regiment. He was wounded and captured following the invasion of Southern France on August 15, 1944. He was first sent to Stalag 14A (Mueldorf), then Stalag 3A near Berlin. Finally, he was sent to Stalag 7A in Moosburg. After doing forced work in the Munich railroad marshalling yards, my father caught diptheria. He was treated by a tall captain from the 3rd Ranger Battalion who had been captured in Anzio, Italy. As I write this, my father is in a hospital with pneumonia. As a result of his combat wounds, he has had physical problems throughout his life. I have tried to locate fellow former prisoners for my father, but to date have been unsuccessful. My father, like many of his generation, chose not to dwell on the negative aspect of being a prisoner of war, and has never fully discussed his experiences. Even after I served five years in the US Army, I was unable to get details from him. The account I have outlined above was obtained as the result of his handwritten response to the relative of another soldier who was seeking information about her uncle, PFC Carl Edward Tatterson (116th Infantry Regiment, 29th Infantry Division), who died in the camp on 20 November 1944. If this message is archived and posted, I would be very interested in hearing from anyone who knew my father and would like to contact him. I can be contacted at my email address of [email protected]. My mother can also be contacted at her address; [email protected]. Either way, we can see that my father receives any messages sent." "An American friend informed me or your site which I have found most interesting. The listing of the number of POW's only goes up to 01/01/45, after that the sudden influx shows a different picture. We small group of Australians were reliably informed at the time by senior members of Patton's Staff they estimated the total figure at the end of April 1945 was at least 135,000 which caused very severe problems for the Commandant. Best wishes and keep up the good work. "My Dad was Russian POW in Stalag VIIA from the end 1944 to spring 1945. As per his words in spring he was transfered to POW's hospital in Memmingen (I guess it was Stalag VIIB). Do you know any sources to the archives where I can track the information about my Dad in these camps. "I recently came across your site whilst searching the web and found it most interesting. My father also called Bernard Freeman was a POW at Stalag VIIA although I do not know the dates. Whilst at the camp he produced a number of painted cartoons and I now have these. Although my father is now deceased it would be really interesting if anyone who knew him and who reads this would get in touch." "Hi, i was a prisoner at moosburg until liberated in april of 1945. we were brought down from the pow camp at nuremberg and were at moosburg for only about a month. perhaps you could help me please. when i was shot down on sept 27 1944 near the town of coblenz we were taken to a small catholic hospital, st joseph's in bendorf, which was near coblenz. after about a month my crew member was taken to a camp and i was alone there they moved three german soldiers in my room with me and we became good friends. i was treated like a wounded soldier and not as an enemy. the only name i can remember was a hans girnstein. i have tried many times to get in touch with any german soldier that was in st joseph's during my stay there but have had no success. if you would have any way of putting my message on the internet over there i would appriciate any help. thanks for any help you can give me." "Just found the web site tonight and am really happy to see it. It brings back lots of old memories that no longer bother me as a former p. o. w. will visit more in the future. I was held in camps in frankfurt, wetzlar, nuremberg until early april 1945, when we walked to moosburg arriving about one week before we were liberated on april 29th. Thank You. I walked to moosburg from nuremberg in april 1945, was shot down dec. 27th 1944 at bruck austria, sent to frankfurt for two weeks then to transit camp at wetzlar, then to nuremberg in early feb. until we walked in april. Nuremberg had to be the worst p o w camp in germany." "My father served in the 5th. Army and was captured at Anzio. He passed through Moosburg and finally ended up at Arbeitkommando 4030, Freiwaldau, a sub camp of Stalag v111c. It is sad that people only think of German prison camps as being like Colditz and The Great Escape. The deaths at these camps did exist, and unlike the account of the "Death March" on B24 net., the lose of life was indeed great." "Wondering if there may be any record there of my Grandfather, David Clifton Miller. Here is a little background on him: Entered Air Force 1942. Based at Great Asfield near New Market East Anglia , UK. Assigned to the 350th Bomb Grp; 285th Bomb Sqdn. Flew B-17 Fortress named "The Stork" (painting of the stork carrying a bomb rather a baby.) Flew 4 raids, and was shot down on the 5th near Appledorn, Holland heading home after bombing marshalling yards (railroads) outside Paris, Spent time as a guest of the Germans in Poland, East Prussia and 3 camps in Germany. Released by Patton's 1st Army at Moosburg (near Munich) on April 29th 1945 after marching from Nuremberg. Thank you so much, any info you could provide would be greatly appreciated." Rolf Schwarz erforscht die Geschichte der Zwangsarbeiter und Kriegsgefangenen in Schleswig-Holstein und sucht dafür noch Informationen: "Speziell über die Zweiglager des Stalag X A Schleswig in Heidkaten bei Kaltenkirchen und in Gudendorf gibt es sehr wenig Dokumente, so dass ich für jeden Hinweis oder jedes Dokument dankbar wäre. Aber auch andere Informationen über Kriegsgefangenschaft und Zwangsarbeit in Schleswig-Holstein wären willkommen." "After the camp VII A was liberated, my father met General Patton in the cook house, and a photo was taken of them shaking hands. My father has been trying to get a copy of this photo for some years - could you help? My fathers name is Mr. Charles Krepper and was in the Queens Own Royal West Kents." "Ich habe mit großem Interesse Ihre Darstellungen gelesen und finde Ihr Engagement großartig." "Thanks for an excellent site - it's a mine of really useful information." "Trying to find how to contact person named A. Consolett, USA who wrote comment to you about her father being captured Aug. 7, 1944 in Battle of Mortain sent to Stalag VII A. I just found out that my father was also captured in same Battle was POW in Stalag VII A. It could be possible that this person's father mine knew each other. Would like to contact this person Also, it was your links that helped me gain much more info on my father's POW experience. Thank you." "also ich werde nicht schlau aus euch!! bei so viel begeisterung für die jahre 39 - 45 !!!!! der ganze nazischwachsinn ist das engagement zu stalag VII doch - objektiv betrachtet - wirklich nicht wert! es sieht manchmal so aus, als ob das zur schau gestellte historische interesse eine verdeckte zustimmung cachieren soll seid ihr nun braun oder nicht ciao hs"
"Your web site is very interesting and I applaud you for your efforts in documenting the history of the camp and town. Thank you for the opportunity of being able to be a part of the Stalag VII-A web site. I hope Dad's contribution is of value to you." Sie haben eine hervorragende Web-Seite zusammengestellt, eine der besten, die ich bisher gesehen habe, sehr interessant und informativ. Ich bin zufaellig auf Ihre Seite gestossen,, als ich nach Kriegsgefangenenlagern in Sibirien gesucht habe. Die Buchliste ueber Kriegsgefangene in der Sowjetunion (u.a. ), die Sie zusammengestellt haben, war schon ein guter Anfang. Mein Vater, Walter Berg aus Oranienburg-Eden, war nach Kriegsende in russische Haft geraten (Grund: Fuehrende Kraft bei Auer in Oranienburg und Anstellung von Auslandsarbeitern). Er ging durch mehrere Lager und war bis 1949 Gefangener in Sibirien. Mein Vater starb in 1955, und ich habe keine Information ueber seine Sibirien-Zeit. Es wuerde mich sehr interessieren, mehr ueber sibirische Lager zu erfahren und vielleicht auch den Ort seines Lagers herauszufinden. Falls Sie mir einige Hinweise geben koennen, wie man diese Suche weiterfuehren koennte, wuesste ich das sehr zu schaetzen. Helmut Berg, RR2 Renfrew, Ontario, Canada K7V 3Z5"
"I was deeply moved when I saw your web page about my father appear on my screen. You did a fantastic job! My father always wanted his story told and I think that he hoped some day that I would write a book about his experiences. He would be amazed to see your web page and I am sure he would find it difficult to comprehend that the internet reaches a far greater audience than any book could. You do an invaluable service by providing personal histories from the World's greatest conflict. My father always believed in the saying that those who do not know history are destined to repeat it. "Ich kann mir gar nicht vorstellen, dass Sie den heutigen Ort des Oflag IV D Elsterhorst im Wehrkreis IV Dresden nicht wissen. Es ist die Gemeinde Nardt in der Nähe von Hoyerswerda. Am 20.11.2000 wurde dort eine Gedenktafel zur Erinnerung an das Lager und späteres Quarantänelager für Flüchtlinge angebracht. Auch die Nutzung durch die Rote Armee für Angehörige der Wehrmacht wurde nicht vergessen. Seit den 50 ziger Jahren wurde und wird die Fläche für einen sehr beliebten Segelflugplatz genutzt. Auch wir Neunutzer dieses Geschichtsträchtigen Geländes sind uns über die Geschehnisse der Vergangenen Zeit sehr bewusst. "Ich habe den Bericht in der Moosburger Seite gelesen und bin sehr damit zufrieden. Sie haben da gute Arbeit geleistet. Auch danke ich Ihnen ganz sakramentisch, daß Sie mir die Überreste des Lagers Moosburg gezeigt haben. Somit habe ich doch eine bessere Vorstellung, unter welchen Verhältnissen diese Leute gehaust hatten. "Your site, moosburg.org is an excellent resource. Thanks for the work of all those who put it together. My Dad, E. M. Brockmeier, survived Stalag VII-A in 1944 and 1945. His reminiscences concerning this time (and previous time in Stalag III, and a prison in Budapest) can be read at: http://www.littlestar.com/brock/." "While I was a prisoner at Stalag VIIA during the winter and spring of '44 & '45, we were working, under guard, in Munich one day when a young lad of perhaps ten years old, riding a bicycle, stopped and the guards allowed him to visit as he had passable English. He offered to try to find some of our group of ten prisoners toothbrushes. We had to leave before he returned and he wrote me after the war explaining that he did find the toothbrushes but we were gone when he came back. I always appreciated what he did and would like to locate hhim if possible. His name is Herman B. Reischboeck and he should be about 65 now. I would appreciate it if I could have some help. Thanks." "I have been visiting this web site for approx 2 years and have found the site most interesting. Like others my father William Paul Clarkson was also a prisoner at Stalag VII A for a large proportion of the war years. Thought it important to record that there were New Zealanders at the camp as I have not seen mention of that during my visits to the web site. My father suffered a severe leg injury,as member of a work party from the camp, while clearing up railway lines which had been damaged during bombing raids (I think). He was a member of the NZEF 21st Battalion who was captured at Sidi Rezegh in Nov 1941 and spent some time in camps in Italy as well as being on the loose before being recaptured and finally being shipped to Germany. I think this story was the same for many soldiers. Fascinating to read the different accounts of visitors to the site." "I wanted to tell you that you have a wonderful site. It was very helpful in understanding what my father could not talk about, he passed away in 1992 of cancer. He was Corp. William D. Blackie Waldron, 13th Armored Division of the First Army who was wounded and captured on September 5, 1944 in the battle for Belgium and was a prisoner in Stalag 7 A according to a newpaper clipping after his return where it mentions this place. He would be happy to know that town Moosburg replaced Stalag 7 A." "I was a B-17 pilot shot down over Munster, Oct. 10, 1943 and then POW at Stalag Luft III. Made the march from there in Jan. 1945 and finally arrived at Stalag VII A. In early April for some unknown reason I was selected to go on a "parole" walk with four or five other Kriegies. An unarmed guard escorted us a few miles to a combination and farm house. The wonderful lady there served us a most delicious meal. A truly memorable occassion. I wonder if it is possible to find out who she might have been?" "I was an American POW at Stalag VII A and would be interested in hearing from anyone from the 103rd Infantry Divsion, 410th Infantry, Company B." "I was a resident of Stalag VII A from December '44 until April 29, 1945. I was in the 100th Infantry Division." "I had not heard of Moosburg before and came upon your site by accident. The POW aspect caught my attention. I must congratulate you on an excellent site. Well done. My wife and I will be in Germany in May and we will make every attempt to visit your Town. Thank you for this site." "the canadian military heritage museum in brantford, ontario, canada, has recently obtained some artifacts relating to a canadian soldier held at stalag vii a.
he was b137404 pte clifferd melville rowbotham of the irish regiment of canada. he was captured on 28 september 1944. his german prisoner of war number was 139164.
we would like to know if anybody has any information about him. information that would be useful - method of transportation to stalag vii a - date of arrival - barrack number - any other information that is available. he died in november of 1999 and his widow provided the museum with some of his records. we are looking to produce a display about him and other canadians who served in italy serving world war 2.
we would appreciate any assistance that you could provide and you would be created in any display that we produce about rowbotham. "Your site is excellent. The information presented appears to be well researched and documented. The site provides an excellent educational experience to school children of any nation. Well done." "I was a prisoner at Stalag VII A from January 1945 to April 29, 1945. I was captured in Sigolsheim in Alsace on 19 December 1944. Some of the guys that ended up in VII A with me were Tony Delizza, Bert Hall, Joe Ribero, Wilmen Johnson. The rest of my buddies were scattered in other camps in Germany. Towards the end we did find each other when the Germans started to move prisoners into VII A. This is a wonderful, well planned, thoughtful site. I am so happy and pleased to have found it. It is a tribute to every one who has spent time in prisoner of war camps. Thanks for your efforts and thoughtfulness with this site. Bill Dennebaum, POW#144404 (still have those old German dog tags)"
"Merci pour toutes ces photos du Stalag de Moosburg! Un de mes oncles y est resté plus de 4 ans. Si vous le souhaitez, je vous autorise à utiliser le contenu." "I want to congratulate you on a great web site. My father was a POW in Stalag 7A during the later part of the war. " Lt. Virgil O.Olson - O-762394 parachuted from a mid air crash into the Sarn valley northeast of Bolzano, Italy on October 20, 1944. He returned to the USA after his internment. I am part of a group of volunteers helping a lady in the USA to find the crash site of her uncle, Lt. William O. Wisner, who also was involved in the mid-air collision with Lt. Olson's airplane. Lt. Wisner was reported killed in the crash of his P-38, but there is some evidence in the government records, that his body was recovered. Records indicate that his identification bracelet was recovered, but it's current location and his Central Identification Laboratory (CIL) file have been lost. Our purpose for contacting you about Lt. Olson's internment is to determine if there may be some information in the Stalag VII A records about the exact location of his capture, his injuries and anything that he might have revealed about the crash site or condition of Lt. Wisner. We have made contact with individuals in the Sarn valley who may have witnessed the crashes of the P-38's there on October 20, 1944. Any information your archives could reveal about the crashes and the recovery of the pilots would help us to verify recollections of the Sarn valley residents and to aid volunteer searchers there to accurately identify the crash sites. I will attach to this message, the German capture report for Lt. Olson. The report was obtained from the 'captured records' section of the USA National Archives." "Thank you for your message about Moosburg. I was never actually detained in VII A. After being captured in Normandy I was sent to VIII B at Teschen, not Lamsdorf (when Teschen was VIII B and Lamsdorf renumbered 344). I was on the march from Hindenburg (coal mine labour camp north of Teschen) through Czechoslovakia to Nuremberg. From Nuremberg we marched towards Moosburg and was released just before arriving there. I am anxious to hear from people who were in Teschen and at Hindenburg and who were on the march from there. Do you happen to know of anyone or any source of information which might help me do so? Best wishes with your website - I am sure it will be a success. There seem to be quite a lot of people who are still alive from Stalag VII A, judging by the internet interest, but people from Teschen seem to be few. - Courtenay Smithers." "Ich gratuliere ihnen zu ihrer wirklich informativen Homepage. Da ich als Schüler der 13.Klasse eine Facharbeit über Kriegsgefangenschaft im 2. Weltkrieg schreibe, würde ich gerne ihre Graphik vom Aufbau des Lager einfügen." I am pleased to have been able to make a small contribution to your very interesting pages." "Very well done website. Quite informative. Significant addition to the understanding of the cost of war and the indomitable human spirits' ability to carry on after great suffering and loss." "Sorry about not being able to communicate in German and thanks to you folks who do the good translation into English so that I can enjoy your fine web site. Tell your grandparents or someone of that generation that some old guy from Las Vegas, who claims to have been a prisoner at Stalag VIIA February through April of '45, sends his compliments for the fine appearance of your city and compliments on its web site and you who make it work." "My father was a POW at Stalag VII-A from 1944-45. On behalf of my family, thank you very much for your wonderful website and the photographs. For the first time I have been able to comprehend what it must really have been like for him during that dark period of his life. Keep up the good work." "You have a great site about WWII camp Stalag VIIa. My father was POW in Moosburg. He was captured in Serbia and transfered to Moosburg camp in January 1944, Mihailo M. Matic, POW number 113946. I'm interested is there any written records about him during his imprisonment, or is there anyone alive who survived the war and might know him. I'll be very gratefull if you have any information about my father you can share with me. "Ich habe Ihre Website sehr interessant gefunden. Mein Vater war Kgf. 1940-45, Oflag VIIC Laufen und dann Oflag IVC Colditz." bevor die fluechtlinge kamen - und danach erst recht. "You have a wonderful web site. I actually stumbled on to the site because I was looking for Stalag VII A. This is where my father-in-law was a prisoner of war for a brief time. As I said earlier you have a very professional web site and we hope to visit your city in the fall. "I believe my father took part in the liberation of Moosburg. He is now deceased. Do you have any information on the liberating force. Anything you could pass along would be appreciated. Thank you so much for your reply. My father was in the 14th Armored Division. This would seem to confirm that he did take part in the liberation of Moosburg. I appreciate you taking the time to respond. "Thank you for your good work for this web site, which I just now discovered. I was an American POW at Stalag VII A in 1945 from mid-February through April. My military service was as a navigator with a B-24 crew of ten airmen. We flew from Spinizzola, Italy, usually northward to military targets. My wife and I have since visited Bavaria in 1985 but did not get to Moosburg. Now, seeing the pictures posted on your fine web site, I wish that we had taken time (and the train?) from Munich to visit your city. We did buy and have shipped a BMW 730i and enjoyed it for ten years. In driving through the Rocky Mountains of the USA, this "Beemer" seemed to think that it was in the Alps and performed very well. Perhaps there are still some old-timers there in Moosburg with memories of us American "kriegies" at the prison camp. If so, please salute them, and thank them for me for keeping us alive during this dark period. And to the German people generally, I send greetings and am pleased that our nations are on the same side working together within NATO to restore peace and civility to southeast Europe. These greetings come from our home in Las Vegas (where we live is greatly unlike what you see in the movies, on TV, or even when visiting here.) But do visit Las Vegas, where we have more and more newer and better resorts. "My father, Danforth Sherman, Lieutenant in 707th Tank Batallion, interned in Moosburg from December (?) 1944 through April (?) 1945 died Monday, March 15th 1999. I am trying to find out more about his capture and time at Moosburg. He would not talk much about it. He did mention the "grass soup" and the difference the Red Cross packages made to the survival of those in the camp. He always felt guilty about surrendering although his unit was surrounded and had little or no ammunition nor fuel. If anyone can tell me about the unit, Stalag, or those who may have known him, it would be greatly appreciated. Dad was from Greenbay, Wisconsin. He moved to Houston, Texas, shortly after the war. He is buried in the Houston National Veterans cemetery. Again, we would really appreciate any information anyone could give us. We tried to find out what we could, but he simply could not talk about his experiences easily. He was a wonderful person. We would like to collect what information we can and pass that along to our children. Thank you. "I was with a group of American Air Force POWs who were marched from Nuremberg to Moosburg. Good web page, thank you for the pictures and information. Ellis Pierson kgf der Luftwaffe 3826"
"Hello: I have just been introduced to your stalag 7 website and congratulate you on the design and content and am especially grateful that you have made those experiences available worldwide...."
"My dad was captured on August 7, 1944 during the battle of Mortain, France. He spent the remainder of the war in Stalag VII A. He has a ring he made in the camp with the date captured on one side and the liberation date on the other. As a student of World War II, I have spoken with my dad often of his time in the camp. I can't wait to show him this website. I bet he has never seen photos of the camp since he left! I am very proud of my dad and his generation that helped save the world!" "I was very excited to see your web page on Stalag VII A. My father (now deceased) was a POW there for 7 months. He was there when the POW's were liberated in April 1945, so I'm assuming he was there from either September or October 1944. He didn't really like to talk about the experience too much, but I believe he had a certain pride deep down that he survived such an event. When I find the information he was able to write down about this experience, I'll forward it to you. I would like to visit Moosburg someday in order to see Stalag VII A. The city looks very beautiful and my father always told me Germany is a very neat and clean country." "Als ehemalige und geborene Mooburgerin ist es sehr interessant fuer mich den Artikel zu lesen. Bitte mehr Information in Englisch denn meine Kinder spechen und lesen kein Deutsch. Moosburg war ja weltbekannt durch das Gefangenlager. Und ich kann mich noch an vieles erinnern nach dem Krieg." "I am writing on behalf of my father, Harry M. Lloyd, who was a POW during WWII. He was captured in the Invasion of Southern France and then spent the rest of the war in Stalag VII-A. I talked with him on the telephone and told him that I had found pictures of Stalag VII-A. He was glad to hear this. Thank you for the information you have on your website. It means a lot to him and to me. My father is writing down some of his memories, and we will be glad to pass them along to you. Thanks again. I told my father about all of this, and he was extremely happy. " "I am conducting research regarding some officers of the USAAF that were interned in a POW-camp in Moosburg, Bayern, in the spring of 1945. I wonder if you have any information regarding this camp? Thank you very much for the link to the Stalag VII A-site. This helped me much! Vielen dank!" Zuletzt bearbeitet am 11.7.2003 vom © Team Moosburg Online (E-Mail) - Es gilt das Urheberrecht!